Dubspot NY Maschine User Group: The Art of Mixing for Club, Radio and T.V. On Wednesday March 4th, our Dubspot NY Maschine User Group continues with a free workshop with demonstrations of mixing techniques and discussions about what it takes to run your own label. Hosted by Maschine Course Instructor/Producer Shareef “TekMaschine” Islam and special guest Ken “Duro” Ifill, a six-time Grammy Award winning engineer. The Art Of Mixing: Mixing for the Club, Radio and T.V. 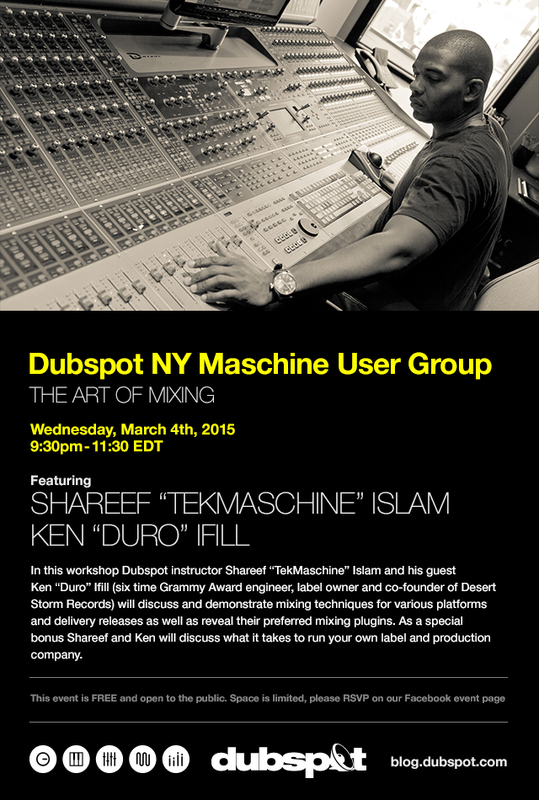 Join us for a free workshop hosted by Maschine Course Instructor/Producer Shareef “TekMaschine” Islam and special guest Ken “Duro” Ifill, a six-time Grammy Award winning engineer and label boss at Desert Storm Records. This workshop will feature demonstrations of mixing techniques that can be used for various platforms and delivery releases, as well as look at some plugins that have been used on commercial hit recordings. Ken and Shareef will also discuss what it takes to run your own label and the steps involved in setting up your own label/production company. Shareef (Azteknique aka TekMaschine) Islam is a producer, engineer, artist, and Dubspot’s Electronic Music Production and Sound Design Instructor. He has worked with established artists such as Q-Tip, De La Soul, Lin Que, Mos Def, Onyx, Jay-Z, Heavy D, Missy Elliot, Busta Rhymes, and many many more. In addition, Shareef has composed and placed music for numerous reality tv shows and networks. Ken “Duro” Ifill is the CEO of Desert Storm Records and a six-time Grammy Award-winning mix engineer who has worked on countless platinum records and iconic artist in the music business such as Jay-Z, Alicia Keys, Will Smith, Fabolous, Mariah Carey, Erykah Badu, Usher, Ashanti, and many more.